New Book by Historian Jason Lavery, Ph.D.
Jason Lavery's interest in Finnish history goes back to his experience as a high school exchange student. He visited three Rotary families and made many life-long friends. He also spent a year as a student at the Helsinki University. From then on, he has traveled to Finland at least once a year to do research, network, and visit with friends. Interview for Newspaper “To Vima,” Athens, Greece, 23 April 2011. Jason has taught at the Helsinki Summer University every year since 1994 except 1995, 1998, and 1999. 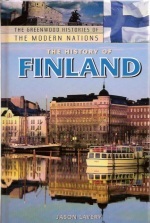 He covers the history of Finland from its first settlement after the Ice Age to the present. This lecture series, open to the public with the opportunity to earn academic credit, consists of eight three-hour PowerPoint-supported lectures. The series draws regularly more than sixty participants of a variety of national and educational backgrounds. Jason lectures in the evening hours from 6 to 8 p.m. Monday through Thursday, usually in June or August, in the facilities of the Helsinki Summer University. Each lecture is enhanced through PowerPoint presentations, handouts, and discussions. Attendants can choose which lectures to attend because each lecture stands alone.